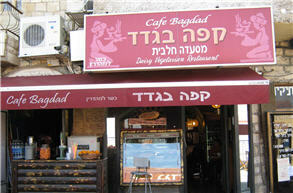 The Bagdad is one of the oldest family run cafes in Safed and dates back to the beginning of the State and is named after the movie, Bagdad Café (and yes, they spell Bagdad without the h, it is not a misspelling). Centered right in the middle of the Midrahov, the Bagdad Cafe is the place to see and be seen. Very popular with locals and tourists alike, The Bagdad Cafe is somewhere to take your time, enjoy your meal and admire the breathtaking view of the of the valley below. Even in the winter you can still sit outside, as there is a see-through plastic cover over the porch, and in summer there are awnings and sun umbrellas to keep you comfortable and out of the hot sun. It is a good place to arrange to meet up with friends as there are plenty of tables and it's easy to find. The Bagdad also has wifi so you can use your laptop or people watch while you wait. Most people don't venture inside, even though it has a bar, is very cozy in the winter and is air-conditioned in the summer, as the view from the porch of the wadi (valley) and Mount Meron is just too good to pass up. Although there is seating for 40 plus outside in summer, and 18 to 20 inside, the Bagdad can still get very crowded in the height of the tourist season. The Bagdad has a varied menu, with Toasts (toasted sandwiches) from 30shks, and an Israeli breakfast at 39shks. The most popular items on the menu are the falafel platter at 39shks, the focaccia house sandwich at 42shks and the many fish dishes from 60-80shks. The huge salads are excellent (42shks +) and if you can agree with your friends which one you want from the wide selection, they are very easy to share. Just ask for an extra plate or fork. Why not have a fruit shake (19shks) or if you prefer your juice without any fuss, you can watch as it is freshly squeezed: orange, carrot or when in season, pomegranate (14shks). Coffee starts at 11shks and if you really want to indulge yourself, go for the cappuccino topped with whipped cream (17shks). There is a choice of wine (70shks up) to accompany your meal, or have a beer or even something a little stronger from the bar. The Bagdad may not be the cheapest place in town, but as they say, you get what you pay for, and the view alone is certainly worth the extra. The Bagdad is usually open during the intermediate days of pesach with a selection of specially prepared pesach cakes. The unisex restroom is inside at the back and is clean and functional, although small. Summer: 8.00am till 10pm or even 12pm in the height of the season.